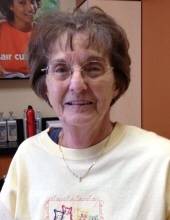 Sara L. Olson, age 75, of Yorkville, IL, peacefully passed away with her family by her side on Saturday, April 6, 2019 at Rush-Copley Medical Center in Aurora, IL. She was born August 9, 1943 in Owensboro, KY the daughter of the late Abraham and Frances nee Corum Wells. Sara worked as a nurse’s aide for over 15 years at Copley Hospital. She was owner of Mom and Me cleaning company for many years until her retirement. In her spare time, she enjoyed ceramics and reading any book on history or her Bible. She is survived by her husband of 57 years David H. Olson of Yorkville, daughters Tony Siebert of Aurora, IL, Robin Mills of S.C., Danna Simmons of Newark, IL, Deborah Goellner of Earlville, IL, 10 grandchildren and 15 great-grandchildren. She was preceded in death by her brothers William G., James T. and Timothy Wells. A memorial service will be held at a future date. Memorials may be sent to the Kendall County Food Pantry, 208 Beaver Street, Yorkville, IL 60560. To send flowers or a remembrance gift to the family of Sara L. Olson, please visit our Tribute Store. "Email Address" would like to share the life celebration of Sara L. Olson. Click on the "link" to go to share a favorite memory or leave a condolence message for the family.